The US is considering sanctions on countries that do illegal business with North Korea, US Secretary of State Rex Tillerson has warned. He said the White House would soon have to decide whether to impose “secondary sanctions” on those nations. The Trump administration has sought to increase pressure on North Korea over its nuclear and missile activities. Pyongyang’s recent missile tests – which are banned by the UN – have sparked international alarm. 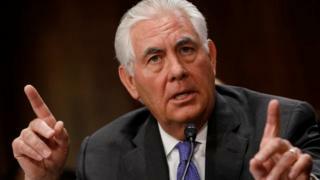 Mr Tillerson’s warning came at a hearing at the US Senate Foreign Relations Committee on Tuesday. Washington has no trade links with North Korea, and has been considering sanctioning companies from third countries who deal with the secretive regime of Kim Jong-un in violation of UN resolutions. However, Mr Tillerson did not name any countries. He said the North Korea issue would be discussed with China, Pyongyang’s major ally, at a high-level talks next week.